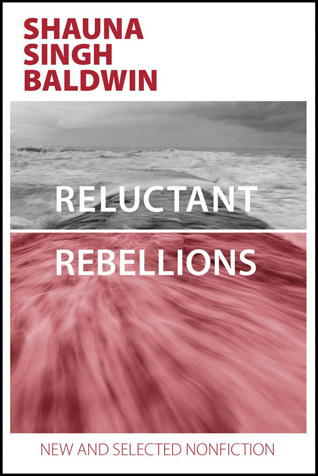 RELUCTANT REBELLIONS: NEW AND SELECTED NONFICTION, by Shauna Singh Baldwin. University of The Fraser Valley, Canada, 2016. Shauna Singh Baldwin’s newest book, ‘Reluctant Rebellions: New and Selected Nonfiction‘, published by the University of The Fraser Valley gives us 139 pages of magic. A compilation of 15 essays and speeches about cultural competency as a post-colonial writer of color, the book explores a myriad of matters related to identity, artistic responsibility, writing as a craft, and the commitment it takes to live as a global citizen with compassion for others rather than as individuals devoted to parochial perspectives. The essays and speeches offer a roadmap for anyone interested in embracing an inclusive perspective and examining the horrible offspring of the union of religion and politics. For writers, this book serves as a manual with its earnest discussion of the elements of craft, the art of storytelling, and the necessity to observe the human condition with unblinking honesty and document it in all its folly. In the opening essay, “Meeting the Bogeyman,” Shauna explores identity. The essay begins by placing us with Shauna in an Indian airport in 2002 where the author and fellow travelers, a couple, are awaiting a flight to Pakistan. The couple is filling out a Pakistan Visitor Entry Form, and Shauna realizes she and the couple are visiting Pakistan for similar reasons: the desire for connection to one’s family and origins. Both Shauna and the couple may perhaps share the shattered legacy that resulted when powerbrokers drew invisible lines for economic and political reasons without giving any consideration to the impact on millions who must then abide by those lines. Shauna recalls the millions killed in both Pakistan and India -- the nations newly created in 1947 through the Partition of Punjab and the subcontinent -- as a result of the invisible line hastily drawn by a British bureaucrat in preparation for a precipitous withdrawal by the Brits within a few months from the land they had occupied for centuries. Across the newly- and somewhat arbitrarily drawn, albeit invisible Pakistan and Indian border, people fled for their lives amid murder and mayhem, the greatest forced migration of people in human history. Shauna reminds readers of the millions of “terrible stories” of that forced crossing that transformed ordinary people into survivors and refugees suffering from debilitating losses of missing and misplaced loved ones, of property stolen, of status eliminated, and of a keen sense of self, reduced, injured, erased. The reader wonders how millions of lives might have been different had people been allowed to stay in place despite the newly-created borders. How would Shauna’s own life have unfolded had her family been allowed to stay in place on their own property and with their own traditions? A Sikh-Canadian woman with an American husband, Shauna travels to the land of her ancestors armed with the mission of seeking specific places where her people might have lived, worked, worshipped, loved, married, and bore children. Shauna describes how the Indian couple filling out the entry form are humiliated upon arrival, accused of being spies since they didn’t have the requisite bribes. Shauna’s foreign passport makes her somewhat immune to the bribes, apparently a game other Indians know. While the couple is detained, her western passport enables her to be whisked through Pakistani customs. Through observation, a keen knowledge and understanding of history, an unflinching examination of the human condition, and her own family’s “terrible story,” Shauna’s essay elevates the particular events of her travels to Pakistan to the universal by connecting identity to larger issues such as the status and suffering of women and children, the human penchant for seeking comfort in nationalism, and human failings embodied when fear fills our hearts and souls, causing us to inflict monstrous cruelty on each other for political and economic reasons, this an ongoing worldwide phenomenon. The next few essays speak to writers and the craft of writing, allowing readers to glimpse Baldwin’s literary genius. The essay “Conflict on a Page” offers a tutorial for creating characters that are living and breathing on a page. “Stay in your character’s point of view. Select metaphors true to your characters, their time and their environment,” she advises would be writers. In “With Contempt or Love?” Baldwin demonstrates how an author’s own perspective can influence a story and its characters, how being on one side or the other when political power is imbalanced can cause literary blindness. In short, embracing subject matter translates into exploring one’s own place within an imbalanced system. Serious literary artists must be open to understanding how their place influences their perspectives of what they consider foreign or familiar and be willing to move from their perspectives to inhabit another’s. Shauna revisits this theme in one of my favorite essays, “Ruthless Terrorist or Valiant Spy.” She gives readers a delicious behind-the- scenes view of the writing and research inherent in her novel, “The Tiger Claw.” If you read and love “The Tiger Claw,” this essay is a treat. Again, Shauna gives readers much more than the efforts involved in the writing and research process. She again explores labels, identity, and how identity shifts or expands to accommodate life’s randomness. She tells readers that she wrote the book first to answer her own questions about the historical figure Noor Inayat Khan, a dedicated member of the French resistance during World War II. Shauna asks us to consider the difference in being labeled a “terrorist” or “a valued member of the resistance.” This question resonates today in our post 9-11 world where the word “terrorist” appears multiple times daily in a single news cycle. But the truths in these pages aren’t limited to the literary-minded. Every piece speaks to the importance of knowing oneself sufficiently well enough to embody compassion for others and enough empathy to realize that others’ perspectives may differ radically but provide equally important truths. The essay that further examines this idea is “Writing in the Time of Terror,” which touches on the laws set aside in the U.S. and the subsequent crimes committed to create safety, in reality creating only an illusion of security and safety. Shauna observes that words attract new definitions as they become redefined to fit the new reality and the new “groupthink” infecting Americans in the post 9-11 era. Here she notes that “under the guise of the Patriot Act, the war on terrorism affects scholars, publications, translations, book tours” and the like. This essay brings to light the fact that Nobel Prize winning Iranian writer, Shireen Abadi’s work is not published in the U.S. because it is literature from Iran, an embargoed country; in reality, it’s literature suppressed in a land that allegedly protects freedom of speech. Put simply, this book is a gem. Shauna gives us a compilation of essays and speeches that offer readers a primer on how to live with compassion and empathy in an ever increasing multicultural world, and it offers writers invaluable craft-focused lessons for documenting the terrible stories and the suffering that characterizes the human condition in the absence of such kindness and consideration. 1: Sangat Singh (Kuala Lumpur, Malaysia), September 30, 2016, 12:37 PM. I have not yet read this book. But with excellent patina of words by Rosalie ji is enough endorsement to get a copy at the first opportunity. I have always enjoyed Shauna's writings and was wondering why we have not had any further offerings from her. Once a writer, there is always something brewing. Looking forward to her latest collection of literary gems. Shauna Singh Baldwin’s New Collection of Literary Gems"